Beirut Lebanon Marine Barracks: Beirut Lebanon October 23, 1983 Where Terrorism Began? by Maggie • October 25, 2009 • Comments Off on Beirut Lebanon Marine Barracks: Beirut Lebanon October 23, 1983 Where Terrorism Began? 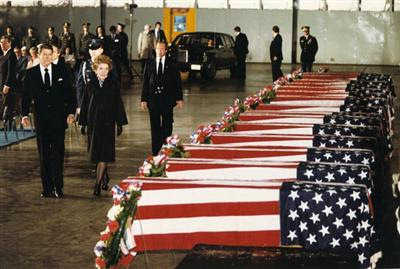 What if American military had not pulled out of Lebanon after the bombing of the Marine barracks on October 23, 1983? Would the Khobar Towers bombings in Saudia Arabia on June 25, 1996 have occurred? The explosives used to kill 19 of our troops are believed to have come from Lebanon. The blast took down 6 high rise buildings. A crater 85′ wide and 35′ deep was left behind. Would the bombing of the USS Cole in Yemen on October 12th, 2000 been possible? Seventeen Sailors were killed, many wounded. Would September 11, 2001 have happened? In “the largest non-nuclear explosion on the planet” we lost 241 Marines, Sailors and Soldiers on October 23, 1983. Listen to former U.S. Military who survived the blast, and their thoughts about terrorism, in the video below. Thanks to Always on Watch, Creeping Sharia and The Beirut Veterans Blog.